In 1998 and in 2002 Philadelphia NOW organized workshops to encourage women to get involved in grassroots politics by running for committeeperson. For a variety of reasons we did not have much success—we started too late and we didn’t have the broad-based networks to reach significant numbers of women. We did much better in 2002 thanks to Liz Terry who organized the project and trained our members to run workshops. Interestingly the people who actually ran (and won) were our members who were giving the workshops. They were convinced by their own pitch! 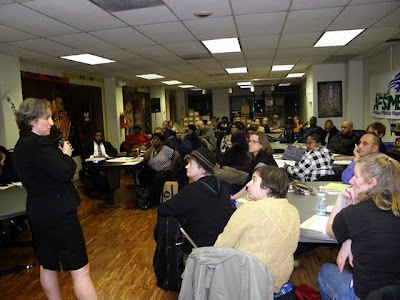 On January 14, 2014, thanks to Tracey Gordon’s amazing organizing skills we held a very well-attended workshop on “How to Run for Committeeperson” in the May 2014 primary. Commissioner Stephanie Singer made a powerful case for the critical role played by committeepeople. She cited a body of research demonstrating that the most effective way to encourage people to vote is having a neighbor/friend speak to them directly. Nothing is as powerful as personal contact with someone you know and trust. I recall when I was going door to door in the 2008 presidential election, some of my neighbors told me that the Obama campaign had been in the neighborhood and were knocking on doors. I wondered why they hadn’t stopped at my house. Then the light bulb flashed—they knew they didn’t need to. Their data told them how best to use their volunteers. And from all accounts, the 2012 campaign was an even more sophisticated operation, precisely targeting those voters most likely to be responsive to persuasion. National campaigns are not a permanent presence in a neighborhood and can’t possibly replace the reliable committeeperson who knows the neighborhood terrain and is out there in every election reminding neighbors to vote and providing the information they need to cast informed votes. But in so many divisions in Philadelphia there are no functioning committeepeople and this has had an impact on over all turn-out. Many of our voters are presidential year voters and tend to skip non-presidential years. If the 2008 voters had come out in 2010, the Pennsylvania political landscape would be very different. In off-year elections, like our recent municipal election, there was no barrage of television commercials to remind voters an election was coming up. As one of the voters in my division said, "there hasn’t been much in the media about the election, and if you hadn’t knocked on my door and reminded me, I wouldn’t have known it was Election Day. Will our efforts to encourage civic-minded folks to run for committeeperson make a difference? There was a lot of enthusiasm at our January 14 workshop, but will this translate into people actually getting the required signatures and running in the primary? Stay tuned.